Loved it, but why oh why, WIll? Okay, I loved this book. I really did. Somehow (and this is rare for me), I empathised with all the characters, even the ones that begged to be disliked. And the flow and pacing was brilliant. I put down the book only because I had to go to bed, not because I tired of reading it. But that doesn’t stop me from being mad about the ending. Not because I don’t like sad endings (anyone who knows my work will know I write what people might call “unsatisfactory” endings), but what annoyed me was the fact that Will turned out to be a bit of a hypocrite in the end. As an able bodied person, it’s impossible for me to understand how someone in his position could possibly feel about losing control of most bodily actions, but after all the encouragement he gave Louisa to go out and live a full life, to make the decision he made in the end seemed very odd. Selfish and unnecessary, really. That being said, this still gets five stars from me because, even though I don’t agree with what happened, that’s probably how people think in real life. Who am I to force my views on the story? 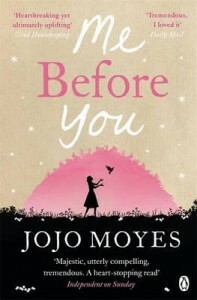 Recommended for readers of love stories, which are really tear jerkers in disguise.